If you are looking for longer-lasting smoothness than you’d get with shaving, and far less hassle than waxing, epilators are the perfect hair removal solution for you. With a host of benefits, including zero tan interference, epilators are a popular hair grooming choice. However, finding the right one can sometimes feel like looking for a needle in a haystack. To help you find the best epilator for you, we have put together this comprehensive epilator buying guide. Finding the right epilator just got easier! Spring Epilators: These original epilators have coiled springs that rotate to pull out the hairs. This was the design of the first epilators. Rotating Disc Epilators: Using a series of discs, rotating disc epilators pull hair from the roots by wrapping around the hair. Tweezing Epilators: Tweezing epilators have rotating heads that mimic a tweezing motion as it continuously pulls hairs out by the roots. Tweezing epilators are the most common epilators used today. Electrical Epilators: Powered by an electrical cord, corded electric epilators eliminate the need for having to replace or remember to charge batteries. Offering much more power, epilating is quicker and with corded units. Cordless Epilators: Normally including a rechargeable battery, cordless epilators offer the most amount of movement flexibility, meaning you do not need to be near an outlet or have to worry about tangled cords. Wet/Dry Epilators: Wet/dry epilators are cordless battery operated units that are designed to be used in and out of the shower. This makes them the best choice for people who don’t want to be limited to dry epilatoring. Face and Body Epilators: If you are looking for something that can be used for the face as well as the body, face and body epilators come with variable speeds and attachments to handle all hair types. They are an economical choice for people who have multiple areas they wish to epilate. 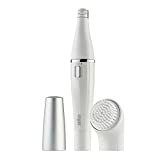 Face Epilators: Face epilators are specifically designed with speeds and fittings needed for finer facial hair. 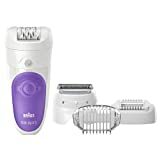 Hair Removal: Hair removal is the most talked about factor of an epilator. 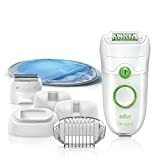 Units that remove smaller hairs and come with a variety of heads for trimming and shaving are rated much higher than others on hair removal and variety. Power: Rechargeable epilators are by far the most popular epilators and are reviewed well by owners. They feel like battery operated units cost them more and corded models don’t give them the freedom to move around. Epilators that have minimum recharge time are particularly favored, and it’s worth comparing charge times of your top choices to ensure you are satisfied with your purchase. 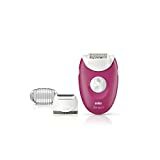 Features: The most well reviewed epilator feature is a roller massager, with many users noting that when compared to previous epilators without this feature, they are definitely less painful. Epilatoring can be painful, so anything that can numb that a little is a good investment as it will mean more use out of your purchase. Accessories: As well as included trimmer and shaving heads, pre-wipes are noted as being a necessary accessory and epilators that include these are appreciated by their owners and get good reviews. The first thing to consider when choosing your epilator is the areas of the body you wish to focus on. Certain epilators are designed for certain areas, but you can find general use epilators with interchangeable heads that can be used efficiently on different parts of the body. Finer hair requires much slower speeds for good removal, while courser, thicker hair will need faster speeds. An epilator that offers varied speeds will ensure you can use it for the varied hair types found on different areas of the body. The fewer tweezers an epilator has, the more suited it is for precision work. The more a unit has, the more suited it is for general use and the quicker it will take out the hairs on bigger areas. Some worthwhile features to consider include high frequency massage rollers, which minimise pain, rechargeable batteries for easy powering up, and pivoting heads that make areas such as knees much easier to navigate. Recommended epilator accessories include pre-epilation wipes, which are used to prime skin before you start for a softer session, as well as ice-packs to cool and relieve skin after. Although some good epilators include these with the initial purchase, you can never have too many! Wet and dry epilators that offer corded power as well as rechargeable power are the best of both worlds. Corded power are great for stubborn hairs, but being able to remove the cord for shower use is a handy time saver. Combination machines that are three appliances in one offer the most versatility. 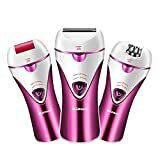 3 in 1 epilators include epilator, trimming, and shaving attachments, saving you the cost of buying three groomers separately. Braun: Braun is an innovative German brand known for their quality electrical appliances, especially in the hair grooming sector. Emjoi: Offering quality personal care products, Emjoi harnesses the latest technology to create quality hair grooming and other personal items. Philips Norelco: Since 1891, Philips have manufactured quality electrical appliances and have become a leading hair removal appliance brand. Remington: Remington is a well known, small appliance brand with a good reputation for making top quality hair grooming products.